Andrew Buck earned his Doctor of Education degree (Ed.D.) 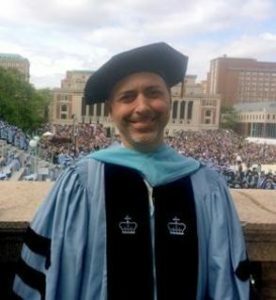 from Teachers College/Columbia University in 2015 after receiving a TC Doctoral Dissertation Grant award in 2014. As a practitioner and educator, he has demonstrated a life-long commitment to the creative arts. In June of 2014, his article regarding the Bunting Biennial in Birmingham and internationally acclaimed ceramic artist Magdalene Odundo appeared in Ceramics: Art & Perception | Technical, an international journal. Previously, he served as National Program Chair for the National Art Education Association (NAEA) Annual Convention and as the Co-Chair for the University Council for Art Education’s (UCAE) Symposium for Art Education Leadership held at the Metropolitan Museum of Art. Additionally, Dr. Buck served as a panel reviewer for New York State Council for the Arts (NYSCA) Arts in Education programs and coordinated VSA Arts Festivals for students with disabilities in NYC. His funding proposals for improving arts education have been awarded over a million dollars in grants from the federal, state and local level for New York City public school students and teachers. His articles on Susan Beiner’s exhibit “Organic Dissolution” in Ceramics Monthly March 2013 and an interview with Takeshi Yasuda in Ceramics Technical No. 36 (2013) can be accessed through ProQuest and most comprehensive academic library databases. Recently, Andrew has given informative and entertaining talks at The School of Visual Arts, Harvard University, and Pennsylvania State University on the subject of adult learning in ceramic art in the context of university MFA programs. In the late 1980s, as a new art teacher, I had an auspicious beginning by launching a recycling campaign at Our Lady of Mount Carmel (OLMC) School, located on the outskirts of Baltimore, Maryland, to build support for their new art program. The project led to extensive local and later national press in USA Today and Reader’s Digest. The school bought ceramic kilns and ran new 220V service to operate the kilns with the funds raised from recycling. Governor William Schaefer presented the school with an Award for Excellence for this creative work. Later, after obtaining a Masters of Science in Education degree (M.S.Ed.) and permanent NYS certification as an Art Teacher, School District Administrator (SDA) and Building Supervisor (SAS), I joined the District 75 team as part of New York City’s then Board of Education Project ARTS initiative. My three main contributions were 1) obtaining grants and supporting schools in the district to write proposals and secure arts educational funding; 2) creating a professional learning community among art, dance, music, and theater teachers in all five boroughs who were challenged by the unique learning styles presented by students with a range of moderate and severe disabilities (developmental, cognitive, and social-emotional); and 3) co-chairing the NYC VSA Arts Festivals with Dr. Bebe Bernstein. During my tenure, many District 75 schools received NYSCA Empire State Arts Partnership Grant Awards, NYFA Arts in Education Grant Awards; and grants from the NYC Center for Arts Education (initially funded by the Annenberg gift) totaling over $1,000,000. I also co-authored a funding proposal by designing the Creative Music Educators project, to support music teachers in developing a variety of strategies to engage students in music learning and music composition. This project was funded by the USDOE at over $900,000. The original proposal concept was recycled and expanded as a decade long project by District 75 and MNMP, most recently obtaining an i3 USDOE grant award close to $4 million. Watching the World Trade Center buildings become enveloped in flames and then crumble to the ground in seconds was one of the most devastating scenes I have ever witnessed. I was at the District 75 headquarters located at 23rd Street and 1st Avenue in Manhattan. The district leadership team, or cabinet as it was called, had gathered in the Superintendent’s office when we initially heard about the first airplane strike. When the second plane hit, I thought, “We are under attack!” followed by the question, “Will this ever end?” We could see from the roof what was happening. Bellevue Hospital, the major trauma unit, was just a few blocks away. As we know, all too sadly, there were very few survivors from inside the towers. Parents and loved ones posted pictures of their missing family members all over the outside of the hospital and ambulances. Many volunteers showed up at the hospital to help and donate blood, but there was very little they could do. It was a very sad time. A lot of teachers and students turned toward art as a way to deal with the loss. I felt like it made me want to work harder at life-affirming or creative things like art and art festivals. The President-elect of the National Art Education Association (NAEA) invited me to chair the NAEA National Convention for 2003. Invited guest speakers included Sir Ken Robinson and Eric Carle. The teachers at the convention lined up like the paparazzi to take photos and greet Mr. Carle. I think it was the first time a keynote speaker at the national convention got a standing ovation before he or she began their presentation. The conference, which had close to 5,000 attendees, was a tremendous success involving a huge team effort of many educators and supporters. The University Council for Art Education (UCAE) is an arts education advocacy group consisting of college and university art educators. I served as a co-chair for UCAE’s Symposium in Leadership for Student Learning in the Visual Arts held at the Metropolitan Museum of Art. Kate Levin, the Commissioner of the Department of Cultural Affairs for New York City, joined many other notable speakers including Charlotte K. Frank, New York State Board of Regents; Jerrold Ross, Dean of St. Johns University – The School of Education; and Mac Arthur Goodwin, president of the NAEA, for the UCAE Symposium. Regional Arts Supervisor Inspiration and Effectiveness: The “Kindergarten to Life” Arts Continuum. Expanding and refining my professional development model for arts education; I initiated “grand rounds” for visual art teachers to visit each other’s schools, observe actual instruction in practice in the classroom with real students, and hold reflective conversations using protocols to glean insights into best practices in Brooklyn. Music educators held mid-day performance concerts with students that were critiqued by a panel of fellow music teachers and outside leaders in music education, and by students themselves in a town hall style gathering. Students and teachers learned through seeing and hearing each other’s work and ideas. Sharing best practices, as well as struggles, set the stage for honest yet caring dialogue aimed at improvement. This discourse also modeled one of the cornerstones of American democratic values: the exchange of ideas and perspectives through respectful conversation. One of my most memorable professional development “events” took place at the Brooklyn Academy of Music (BAM). Principals and assistant principals were invited to watch, learn, and listen as a progressive performance unfolded of elementary, middle school, high school, college level and professional violinists and cellists. There were a couple of reasons for doing this. First, not many people appreciate or even know what developmental levels of music performance look like or sound like along the K-professional continuum. Secondly, I expected school leaders to walk away with increased appreciation for the significance and importance of sequential, uninterrupted study of the arts throughout the K-12 lifespan. Howard Gardner speaks to this issue in regards to the importance of developing mastery in one domain. Everyone in that spacious hall, including special guest arts advocate and gallery owner Danny Simmons, saw and heard the outcome of years of focused, dedicated artistic practice. Of course, after any school year of hard work and based on one of the Principles of Learning: Celebrating Student Achievement; I always arranged a good arts festival. Region 8 Brooklyn Family Arts Festivals were distinct in their range of performances, activities, and exhibits that intertwined a seamless collaboration of young people, families, teachers, and professional artists who shared common interests and values in the visual and performing arts. To the teachers, administrators, students and funders who worked so hard to make those arts festivals possible, I take my hat off to you. Perhaps enough has been said for you, the reader/viewer, to develop an appreciation for my commitments and values to become clear. However, I wish to draw attention to one small initiative that might serve as a model which others may wish to develop and expand upon. While in Region 8, I piloted a Digital Image Laboratory at the Brooklyn High School of the Arts. It served as a work-study program for high school students who were given stipends to digitize other student’s art work from the district, and develop archival quality, large-scale prints for exhibit and posterity. It had a simple conceptual design: take kids seriously, give them responsibilities, and let them grow with new opportunities. In the back of my mind, I kept thinking the Digital Image Lab was a form of legacy from my college internship days. Back then, I apprenticed with Bob Blackburn at The Printmaking Workshop in NYC learning about the life and community of artists. At The Printmaking Workshop, people were taken seriously and treated with respect, even in the quest that accompanied high expectations for substance and quality. I thank Urban Arts Partnership, Verizon, and the NYCDOE for supporting the Digital Image Lab as a caring, pre-professional learning environment for those high school students who took their work seriously.